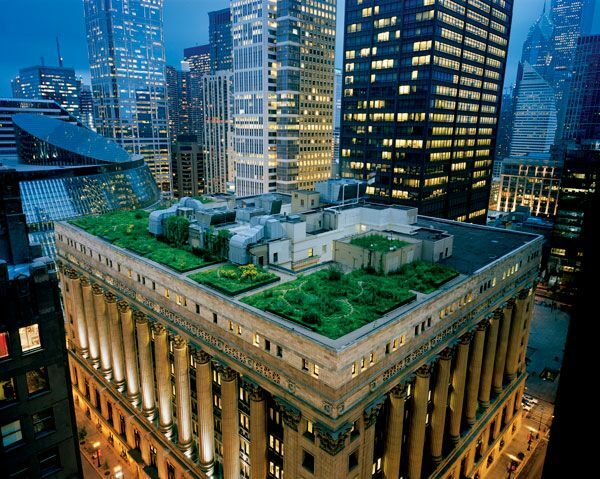 Chicago City Hall Green Roof by Atelier Dreiseitl and Conservation Design Forum. The typical image we all have of a city is of towering high-rise blocks, densely packed tarred streets and a generally hard urban environment. Nature is isolated in manicured green parks or in linear rows of gray-looking trees. The city is perhaps the furthest thing from a natural environment and the closest thing to an urban desert. But what if we begin to green this concrete jungle? Projects such as the High Line in New York have shown this can be done, and the wave of vertical green walls has created a new ecological fashion statement. 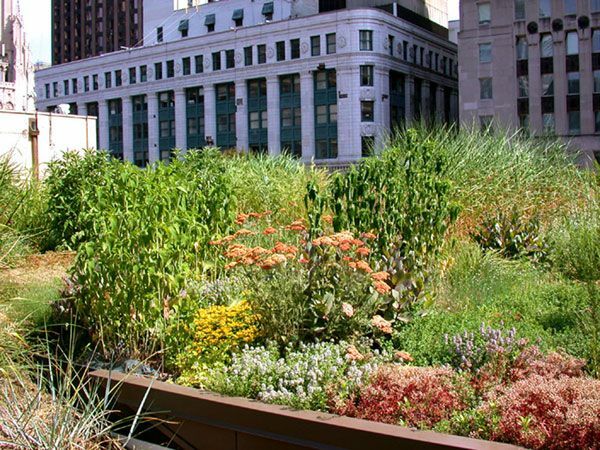 There is, however, one method that trumps all of this in terms of long-term benefits: green roofs. Urban Heat Island Effect The city of Chicago was forced to consider this option after a heat wave in 1995 claimed a number of lives due to extreme inner city temperatures. These extreme temperatures were caused by the “Urban Heat Island effect”, in which heat in the city is absorbed by pavements, buildings, and asphalt. Stormwater in Chicago is also a major problem because the city’s stormwater and sewage systems are combined. 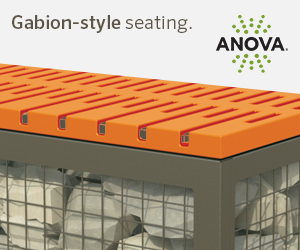 This means that during a downpour, the system is overwhelmed, resulting in overflows and sewage pollution. 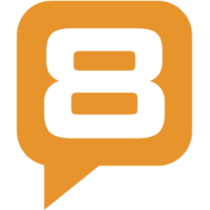 Urban Heat Island Initiative With this in mind, the Urban Heat Island Initiative was launched. 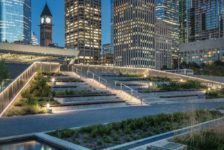 It didn’t take long to realize that the city’s lack of green space combined with the need to deal with stormwater meant that the best option to deal with the Urban Heat Island effect was to add green roofs. The pilot project for the initiative was earmarked for the 11-story Chicago City Hall and was completed in 2000. This building was structurally ideal, as the roof was initially built to receive additional floors. It also provided a good scientific comparison, because only half of the symmetrical roof was to be planted, leaving the other half in its original black tar state. The idea was to use the project to test the benefits of green roofs on air temperature, air quality, and stormwater absorption. Trees are usually not included in roof gardens due to their extreme weight and depth requirements, but the intensive design accommodated two trees that were planted on cantilevered platforms over structural columns. In total, 20 000 plants of more than 150 indigenous species were planted in the 1,885-square-meter roof garden. Roof Garden Design The design of the garden was developed by Conservation Design Forum, which responded to the historical nature of the building by creating a symmetrical design and dividing the garden into regular shapes. The roof garden was not intended for public access, and thus the design focused on providing a functional green space that was aesthetically pleasing from above, with simple circular pavers providing access to the garden for maintenance. The design of the waterproofing systems for a roof garden is critical to ensure that the roof is protected from water and invasive roots. The City Hall design opted for a base of Sika Sarnafil’s Loose Laid Waterproofing System, which was easy to install over the existing surface and acted as a leveling layer. This layer then received various layers of extruded polystyrene insulation and separator sheets followed by the roof membrane on top. An additional protection layer was laid on top of the roof membrane, followed by the additional insulation of a filter layer and finally the growing medium with erosion blankets to keep the soil in place. Cost Vs. Long-Term Benefits While installing a green roof can cost two or three times more than a conventional roof, its benefits outweigh the initial costs, and it can be a lot cheaper in the long run due to energy savings. 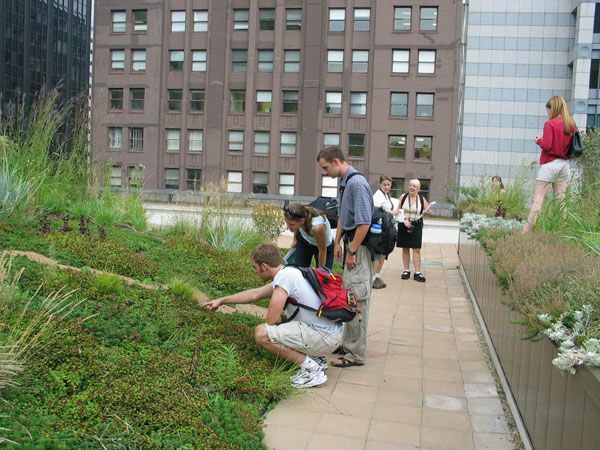 Green roofs improve air quality, conserve energy, reduce stormwater runoff, and create natural habitat. 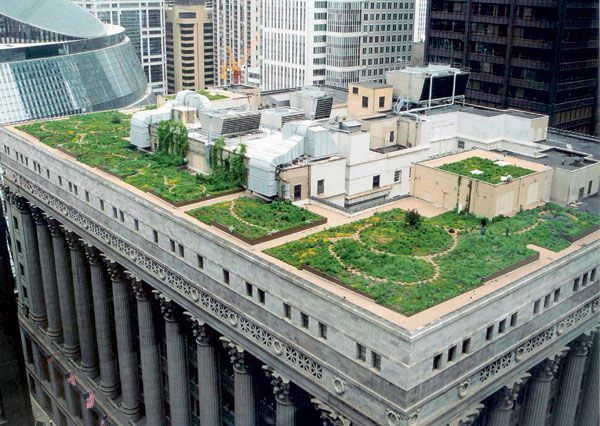 The Chicago City Hall green roof is a perfect example of this, and the monitoring of data on the roof has clearly indicated that the green roof has managed to not only reduce the Urban Heat Island effect, but has created numerous other benefits. Data has shown that on average, the roof is seven degrees cooler than the surrounding roofs, that it can retain 75 percent of rainwater, that it has reduced energy consumption of the building by more than $5,000 a year, and that it has reduced noise pollution by as much as 40 decibels. 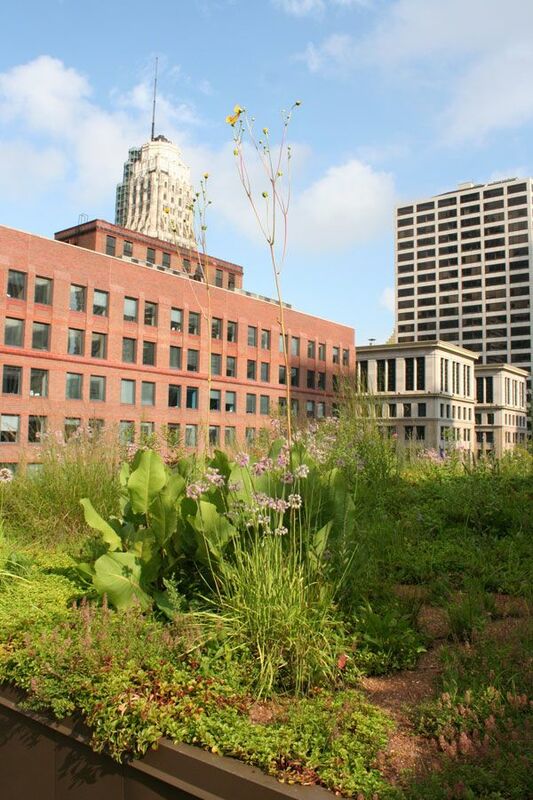 The green roof has also produced a thriving plant population that not only provides habitat for various insects and birds, but filters pollution from the air. A number of beehives have even been included on the roof, providing habitat for a highly endangered insect while creating a productive rooftop landscape. 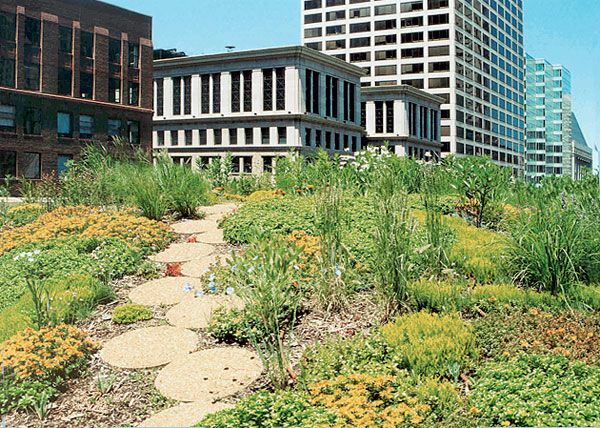 Chicago’s Green Roof Initiative The success of City Hall’s green roof has led to Chicago establishing its own Green Roof Initiative, in which more than 200 vegetated roofs have been planted in the city. One of the most famous is Millennium Park, which is so large (almost 10 hectares) that it’s more of a park than a garden! 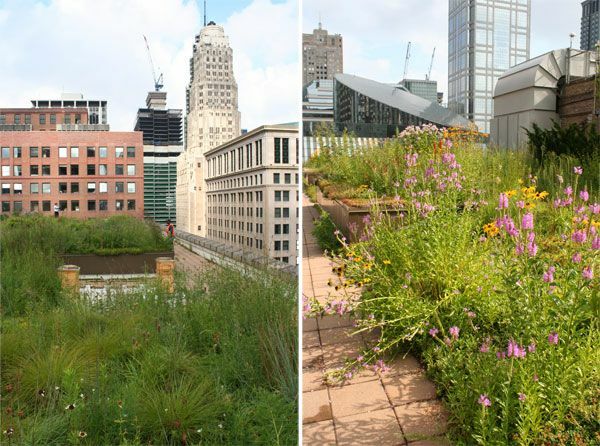 So perhaps we can’t win the fight between the city and the natural environment, but we definitely can use green roofs to begin to naturalize cities and create a new urban and green landscape.